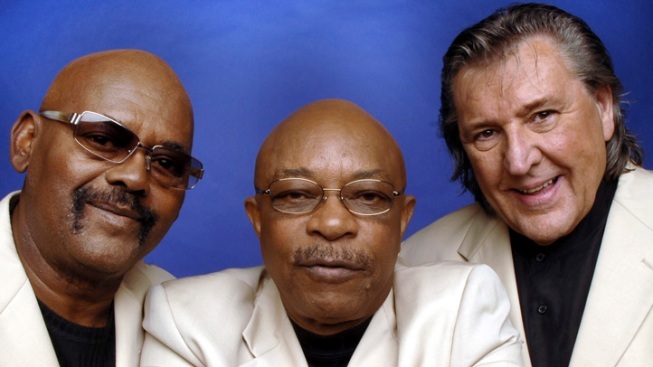 Babbitt died Monday of complications from brain cancer in Nashville, Tenn.
Bob Babbitt (R), pictured here with Uriel Jones and Eddie Willis of the Funk Brothers, has recorded with music greats such as Bette Midler, Jim Croce, Bonnie Raitt and Frank Sinatra. Prominent Motown studio musician and Funk Brothers member Bob Babbitt, whose bass playing pounded through the Temptations hit "Ball of Confusion" and Marvin Gaye's "Mercy Mercy Me (The Ecology)," has died. He was 74. Babbitt died Monday of complications from brain cancer in Nashville, Tenn., where he had lived for many years, his manager David Spero said in a statement released by Universal Music, the label in which Babbitt contributed to numerous hit records. Well-known for decades among musicians, Babbitt laid down bass lines on Stevie Wonder's "Signed, Sealed, Delivered," along with "The Tears of a Clown" by Smokey Robinson and the Miracles, "Inner City Blues" by Marvin Gaye, and Edwin Starr's "War." "Bob was a teddy bear of a guy," former Motown engineer Ed Wolfrum told the Detroit Free Press. "And he was an extraordinary musician — a player's player." After leaving Motown, he recorded with Bette Midler, Jim Croce, Bonnie Raitt and Frank Sinatra. In all, he played on more than 200 top 40 hits, including "Midnight Train to Georgia," by Gladys Knight and the Pips and "Ready to Take a Chance Again" by Barry Manilow. Babbitt gained wider public recognition through the 2002 film about the Funk Brothers, "Standing in the Shadows of Motown." "He was one of the last of the breed of journeymen bass players who were total pros, could go in and crank out a hit, go to the next session and crank out another one," Allan Slutsky, the film's writer and producer, told The Detroit News. Babbitt was born Robert Kreinar on Nov. 26, 1937, in Pittsburgh. He got his first music work freelancing around Detroit in the mid-1960s and joined Stevie Wonder's touring band in 1966. The next year he became part of Motown's house band, known as the Funk Brothers. Babbitt had lived in Nashville for 26 years but he told The Tennessean in 2003 that he toured so much that he got little work as a sessions player in the city's recording studios. "I couldn't get producers on the phone," he said. Babbitt is survived by his wife, Ann Kreinar, and their children, Carolyn, Joseph and Karen.